Antoine: As for you sir, have you read "Don Quixote"? Cyrano: I have, and found myself the hero. Cyrano: My enemies change, then, with every wind? Antoine: ...may swing round their huge arms and cast you down into the mire! Cyrano: Or up, among the stars! These days I hear plenty of descendants of Antoine Comte de Guiche. They're on broadcasts, the radio and print. They're telling me that Joe Mauer isn't going to hit .400. It's not a reflection on Joe, mind you, but nobody is going to hit .400. Nobody can. In the modern game, it's impossible. But increasingly, the reasons behind their statement strike me as kind of fuzzy. Mathematics are sometimes mentioned, suggesting that even one small slump dooms the effort. 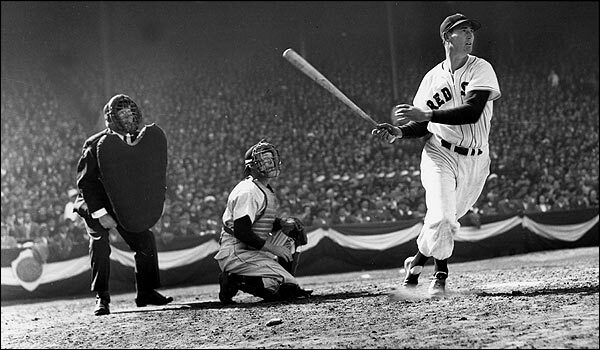 But those mathematics haven't changed since Ted Williams hit .406 in 1941. Of course, that’s the real reason people ardently believe hitting .400 can't be done. It’s been 68 years. That's what drives the other reasons that are offered, such as the improvement of field conditions, the increased role of bullpens, or the better fielding of players. But that's not reality. Evidence suggest that players are far more likely to hit .400 in this modern era than they were for the last couple generations. Some have already come closer than you think. And for you Twins fans, the evidence further suggests that Mauer is a pretty good candidate to hit .400. If not this year, then in the future. Check out that "Year" column. In the decade that Williams hit .400, only Stan Musial came close in 1948. In the 50's, only Williams 1957 year makes the list. There weren't any in the 60s, which is why, when Sir Rodney Carew made his run in 1977 it was big enough to make the cover of Time. So that's one close attempt per decade or less. But more recently, it's become more frequent. In the 80s, there were two players that came close. In the 90s, it happened four times. And in the aughts there have been four more (if you count Mauer). It isn't becoming harder to hit for a high average. It's becoming easier, or at least more players are getting close. Looking at that breakdown by decade, the trend makes perfect sense. When was pitching most dominant? The 60s, and since then various rule changes have been implemented which favor the hitters. It's become a hitter's game. We've been seeing more offense than ever before. Why wouldn't we expect higher batting averages too? And players have been getting close. I knew that Carew needed just eight extra hits, but three players have come quite a bit closer than that. Both George Brett and Williams (in 1957) were within five hits of glory, which is less than one more hit per month. And Tony Gwynn was just three hits shy in 1994. Are we really so sure that Gwynn couldn't have picked up one more hit every other month? Hitting .400 is eminently possible, and it is more doable now than it has been in the last 70 years. Mauer also looks to be a pretty good candidate to do it. The previous batting titles suggest he has the necessary raw ability, but if you look at the chart again, he has a couple of other things working for him. Of the thirteen close calls, eleven came from left-handed hitters, which Mauer is, of course. He's also very young, tied with "Nomah" Garciaparra and Todd Helton on that list as the youngest. Players don't need to reach that milestone in their youth. If it doesn't happen this year, it doesn't mean he won't have a few more opportunities ahead of him. Hitting .400 isn't jousting with windmills. Players had come very close, they've been getting closer, and Mauer is a prime candidate. That doesn't mean it's inevitable or even probable. Seventy years of unrequited effort demonstrate just how difficult it can be. But it also demonstrates what makes it worthy of our attention. And there's plenty of reasons to hope we'll soon see a player raise himself to that level. #3 - After a week of waffling, it looks like I'm going to the Twins game this afternoon, and I'd be honored if you followed along with me on Twitter. My realtionship with that goofy little service is evolving, but I'm coming to the realization that it's a mighty fine venue for someone who doesn't get to write about 90% of the stuff he thinks about. I just need to discipline myself to actually stop and spit (twit?) it out. #2 - I'm paying for a new utility that, at least for a short time, I'd encourage you to take advantage of. It's up there in the upper-right-hand corner. You can now sign up to receive an email of each new post that I put on this blog automatically, so you don't miss anything. That might be especially handy during the offseason, but I also thought it might be nice to have as we approach the trade deadline. #1 - Speaking of the trade deadline, I'd really like to encourage you to stop by on Monday. You'll have a chance then to be one of the first ones to purchase and review a new e-book that I'm putting out with a few other talented Twins bloggers. We'll be finishing, editing and polishing it this weekend, and based on what I've seen so far, I'm pretty excited about it. I'm very lucky to have so many other talented, entertaining, analytical and independent writers cover my favorite team. There will obviously be lots more details on Monday. See you then! Well penned, good sir. Always enjoy a good literary reference. "But those mathematics haven't changed since Ted Williams hit .406 in 1941." John, are you familiar with Stephen Jay Gould's essay about the decline of the .400 hitter? He argued that it was due to the decreasing variability of batting averages, which in turn was a consequence of the increasing overall level of play. The good news is that the the increasing number of runs at .400 in recent years doesn't look like a fluke--very high batting averages really became a lot more likely in the 1990's. The bad news is that things seem to have reverted to the postwar norm. So it would really be something if Mauer could pull this off. The thing that I found interesting in doing this analysis is that if you assume batting average to be normally distributed (which it appears to be, looking at the historical data), it's much harder to hit .400 even than it is to hit .390, more so than I would have though. Of course anything is possible (as KG would remind us), but Mauer is a huge, huge longshot to hit .400 as long as he remains a catcher. It's going to get a lot tougher to get those hits the more beat up he gets as the season wears on. His career first half average is .339 and his career second half average is .302. For that matter, Mauer's not even hitting .400 these days anymore. And if you figure he gets the bare minimum 500 PA, and maintains his AB/PA ratio, he'd get about 200 more AB and would need roughly 83 or more hits to hit .400. He only has 87 hits so far. So Mauer's only barely halfway there (and less than halfway if he gets more than 500 PA) and it's taken him his best half-season to get there and the easy part of the season is over. I think it's perfectly legitimate for people to not get their hopes up just yet. You should check out twitterfeed (www.twitterfeed.com?) - it automatically creates a tweet from each post to your blog.